You can’t make a silk purse out of a sow’s ear; and the same is true when it comes to silage. If you don’t have good grass, managed in the right way, it is impossible to make good quality silage. Fortunately, silage-making is more a science than an art, so by following our step-bystep guide you can maximise forage yields, quality, and cow health. It is important to tailor the grass and silage to its task: Choose the right varieties, husbandry and management to produce the quality and yield you require. Do you want high energy rocket fuel to boost yields, or a low energy, fibrous crop for dry cows? Achieving 4,000 litres of milk from forage is a realistic target, with good silage reducing feed costs and bolstering cow health. Select the right grass breeds and varieties for the pasture, to balance yield and quality over a defined reseeding period. Rye-grass is a common option, with clover to boost yields and protein and reduce fertiliser demand. Low pH and nutrient levels will reduce yields and grass quality. Grass can use 2.5kg/ hectare of nitrogen a day, so take soil samples and account for manure, slurry and dung from grazed stock. At 30% dry matter a tonne of grass contains 2.1kg of phosphate and 7.2kg of potash, so be sure to replace P and K regularly. Sulphur is also important, especially in later cuts on sandy and shallow soil. Weeds will decrease silage yields and quality, so assess pastures in spring and apply herbicides if required. Molehills will contaminate silage and can damage machinery, so carry out mole control in November and roll the field in early spring when conditions are suitable – this will also bury stones. If grass dies over winter rake it in spring to remove dead matter, or mob graze with sheep in late autumn to encourage healthy regrowth. This is the most influential factor affecting silage quality which the farmer has control over. For example, silage cut in early May might have 25% crude protein, 75 D Value and yield three tonnes/hectare dry matter. Two weeks later yields will have risen to 6t/ha but protein will have dropped to 18% and D Value to 68. After another fortnight yields might be at 8t/ha, with protein down to 12% and a D Value of 60. This illustrates the importance of assessing your silage needs and cutting accordingly – not just on the date the contractor can make it or the time of year you usually make silage. Timing is also relevant when it comes to fertiliser and herbicide applications – make sure they have sufficient time to work before harvest, otherwise it is a waste of money. And, of course, it is critical when wilting. Grass should be wilted as quickly as possible, and certainly for no longer than 48 hours. Aim to cut grass at 80% moisture (20% dry matter) and wilt it down to 25% dry matter for a clamp, or 35-45% for bales. Make sure the swath is correctly presented to the harvester to avoid contamination or wastage. When it comes to harvesting, preparation is everything. Make sure equipment is well maintained and ready to go to avoid costly breakdowns at critical times. 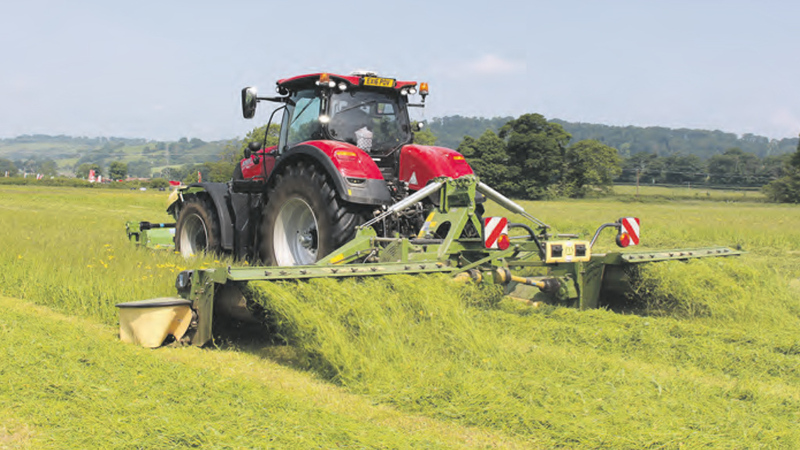 There are a number of different options when it comes to mowing, tedding, raking and harvesting, so it is important to assess the farm needs, labour availability and handling capacity to maximise efficiencies and silage quality. Sugar content is highest in the afternoon after the plant has photosynthesised, so that is the best time to cut, when the pasture is free from rain or dew. Choosing whether to condition can be difficult: Conditioning breaks the waxy cuticle on the leaf, speeding up water loss during wilting by up to 20%. The problem is if it rains, as the leaves will then reabsorb water more quickly. If using a conditioner, it is important to set it correctly – too harsh and it will pulp the grass and increase fuel usage – too light and it will not work. Stubble height should be set at 5cm – if you cut too low it will impede grass regrowth, blunt the mower blades, and increase the risk of contamination. The base of the plant is also low in D Value so does not contribute much to silage quality. 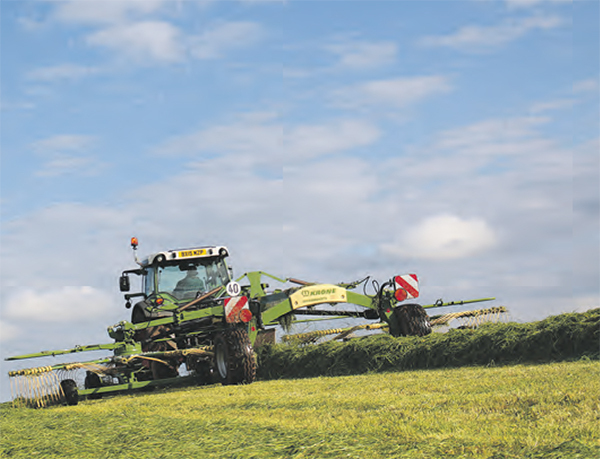 In-field checks and settings are vital to maximise efficiencies and silage quality. They do not take long and can have huge benefits. Change mower blades regularly – if they are blunt they will not cut the grass cleanly, dramatically slowing regrowth. If the ground is dry, set the spread width to maximum to increase the surface area for rapid wilting. If the ground is wet, leave the grass in a swath, allowing the ground to dry out either side before tedding. Tedding will speed up wilting time, and mixes the grass to give a more uniform wilt and therefore more uniform quality, with fewer hot/wet spots in the clamp. Set the tedder height in the field, with tines 2-4cm above the ground. Drive forward slowly and check if they are scraping the soil or leaving grass behind. Too low and you’ll contaminate the silage and increase machinery wear, too high and you’ll leave a mat of grass behind. It’s also important to match your tractor speed with the RPM of the PTO shaft – if you need to cover more ground go for a wider spread; do not drive faster as it will affect silage quality. Presentation of the swath to the harvester has a big impact on efficiencies and quality – you want an even, boxshaped swath for a smooth, consistent flow. Row up just before harvest so that the grass quality remains uniform – too long in the swath and the top will wilt more than the bottom. Set your rake height correctly, otherwise you will either pick up stones and soil, or leave grass on the ground which will rot and damage the next rotation. Match the tractor speed to the RPM of the PTO shaft; higher dry matter crops will take less moving then wetter crops, so you risk throwing it too far or leaving some behind. A farmer’s choice of harvesting technique depends on what type of silage they require. 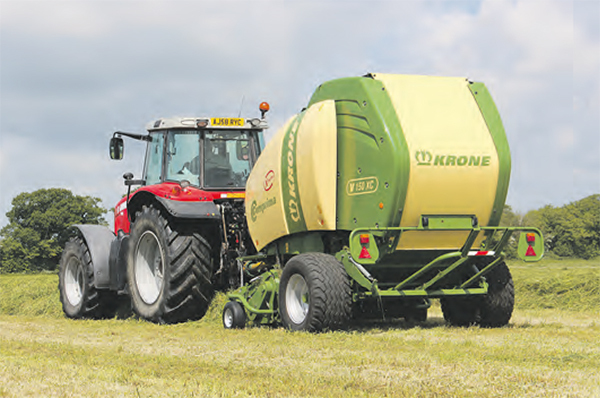 Many will use a forage harvester or wagon for high-quality silage, with lower energy crops baled for feeding to dry cows. 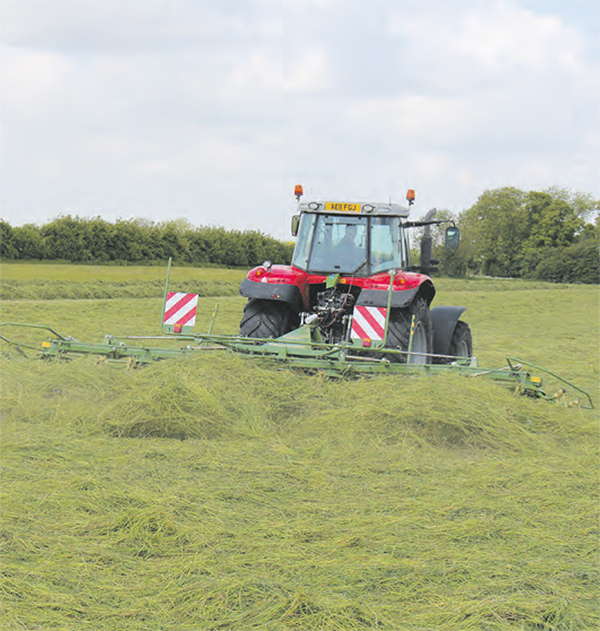 When choosing equipment, ensure there is enough capacity to manage the crop in the clamp at the same time as harvesting, so every stage of the silage-making process can be undertaken at the correct time. The same is true of using a contractor – ensure they can do what you want, when you want, to achieve the right quality silage. Savings on contractor fees can quickly be lost through reduced quality forage. 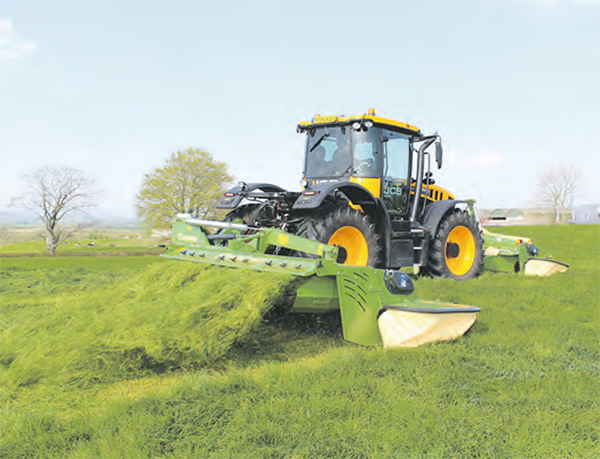 Whether trailed or self-propelled, a forage harvester ensures a uniform chop length and gets the crop into the clamp quickly. Having been chopped, it can also be consolidated quickly. Having a higher capital cost, this option will be chosen to suit the feeding regime. Although it does not give a precision chop length, a forage wagon is cheaper to run than a harvester. However, the less uniform silage will take longer to buck rake and consolidate in the clamp, although there is an argument that longer chop lengths are good at slowing the cows’ digestion process. Choices will depend on whether you want bales wrapped or not. Round combi-balers wrap on-themove, saving labour, but they are more expensive to buy. Square bales have to be wrapped separately but can be stacked and stored more easily. Good quality silage should be light brown and palatable with a sweet smell, and should keep for years in anaerobic conditions. High in carbohydrates with a low moisture content, there is a balance to be found between yield and digestibility, as higher yielding crops will be more stemmy and lower quality. First cuts will have higher energy, with later cuts being more fibrous. However, if the crop is too dry it will be difficult to compact and will have a low sugar content, leading to poor fermentation and spoilage. Poorly made silage will result in high wastage as the cows will not want to eat it. It can also make cows ill: Listeria, botulism and clostridia thrive in the soil and can be picked up when harvesting the grass.